When mummies attack! Why specificity matters for coevolution « Nothing in Biology Makes Sense! A winged adult aphid being attacked by two wasp parasitoids. Photograph by Christoph Vorburger. “metamorphosis takes place within a cocoon spun inside the host’s dried remains, forming a ‘mummy’ from which the adult wasp emerges” (Rouchet and Vorburger 2012). In order to test the ability of particular parasitoid genotypes to infect hosts, you need a clever trick to generate replicates. Just like Star Wars, the authors act as the benevolent New Republic and generate a clone army of parasitoids. They also generate a series of clonal lines for the hosts as well. They are able to accomplish this feat because both species sometimes use parthenogenesis to produce offspring without fertilization instead of the common sexual reproduction. With parthenogenesis, mothers produce offspring with only their genetic material. Experiment: The authors created 15 different host lines, most of which were naturally infected with the protective symbionts (more on this bit later). They infected each of these host lines with three different parasitoid clones in a fully crossed design (45 separate comparisons). Key result:Rouchet and Vorburger (2012) demonstrate that there is variation in the infectivity of the parasitoids clones and this was dependent on the host lines with a significant interaction. This interaction term in their statistical analysis is evidence of the specificity of the infection and defense. In building up this experiment, the authors include natural infections of the defensive symbiont. In doing so, as the authors point out themselves, the host-symbiont genotypes become confounded statistically. 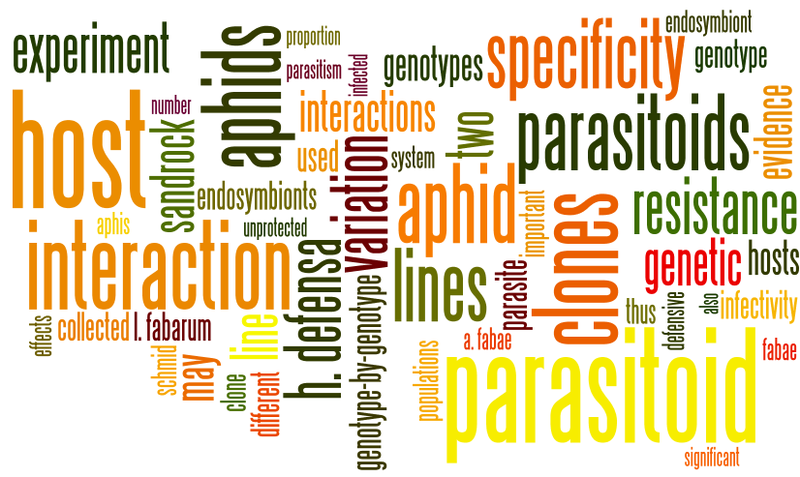 Therefor, the specificity of infection ability of the different parasitoids may be the result of interactions not with the host genome, but with the symbiont genome. However, Rouchet and Vorburger suggest that there is a strong amount of vertical transmission of the symbiont making its genome heritable as well as generating a shared fitness among host and symbiont. Previously, this same group looked for specificity in of the same host-parasitoid interaction using hosts that lacked the symbiont. That research (Sandrock et al 2010) did not find any evidence of the genotype-by-genotype specificity found in this experiment. This further supports their conclusion that the aphid defense is the result of the particular symbiont strain they carry. 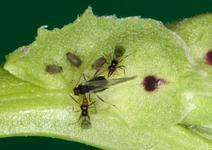 In order to develop a causal link that aphid (host) defense is mediated by the symbiont, the authors propose that the next logical experiment would be to cure the aphid lines of the symbiont, ridding the hosts of their protection. If the symbionts are the mechanism generating the specificity of protection from the parasitoids, then we would expect to see increased infection rates and a lack of genotype by genotype interaction, no specificity. The Vorburger research group has already done some of this research by looking at experimentally infected aphids in a paper from earlier this year (Schmid et al 2012). You can read more about that specific paper over at the Parasite of the Day blog by Tommy Leung. In addition to all the cool empirical work, this research group is also generating some interesting simulations looking at different models of genotype interactions among hosts and parasites that may not fit the typical ones often use by theoreticians (Kwiatkowski et al 2012). This entry was posted in coevolution, parasitism and tagged coevolution, empirical, host-parasite, Red Queen, virulence. ← Friday Coffee Break, Vienna Style!